I was issued a challenge and gifted an ingredient: Marmite in a cocktail. For those of you not familiar, Marmite is a yeast extract popular in England, often spread thinly on toast. It is strong. Pungent. An acquired taste at best. A cocktail is probably not your first thought on tasting it (unless that thought is to mask the taste). Not one to back down, I took the Marmite (Marmite Gold as it turned out, a special edition with gold leaf) and after many unsuccessful iterations present Great Scot. * For the simple syrup, reduce 2 cups of water with 2 tablespoons brown sugar and 2 teaspoons of Marmite. The idea here was not to mask the Marmite flavor, but really to highlight it. 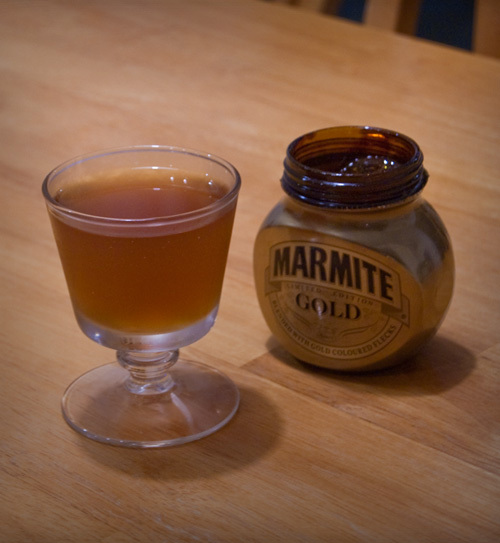 If you don’t like Marmite, chances are you will not like this drink. It is certainly more savory than sweet, as I think is appropriate. Initially, I started down the road with Mezcal, thinking it might pair nicely. It really didn’t. I also had trouble with the Marmite, as it hardened when mixed with liquid into a sort of hard Marmite candy. To get around this I reduced it in some boiling water along with some brown sugar. My house stunk. After a couple attempts with Mezcal, I tried Old Tom Gin, a slightly sweetened gin, and that worked much better. The Yellow Chartreuse’s herbal qualities I thought played nicely with the Marmite, certainly keeping it featured but toning it slightly down. 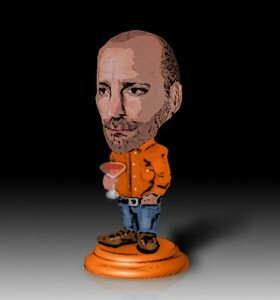 The name is a nod to the issuer of the challenge, and hopefully (perhaps only) drinker of the cocktail. A fun challenge. An odd drink.